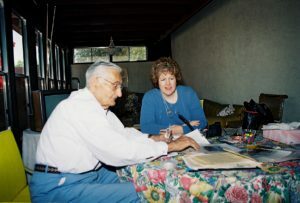 A scene from interviewing Henry Zguda in 2003. To Henry’s right lay original documents on Auschwitz stationery that he shared with me and will be included in the book. For those who have followed me for some time, you know the thousands of hours I’ve invested in telling this story that came to me by chance nearly fifteen years ago, and that I followed by instinct, even at times letting the project lay dormant for several years as life, well, intervened. I only knew Henry Zguda for one year. 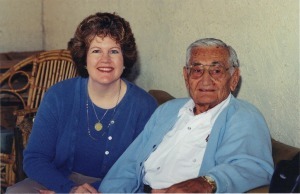 I met him in November 2002 when he was 85 years old, and he passed away a year later. Though others had asked to write his story through the years, he only said yes to me. Imagine finding myself entrusted with a man’s story – if I don’t tell it, it will be lost. Am I excited? You bet. Please keep reading, and spread the word to sign up for the email list and follow me on Facebook at Read Katrina Shawver. Target publication is late 2017. Yes, this is the year of the book, and it will be available in hardback, paperback and ebook formats. 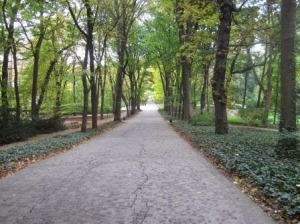 Łazienki Park in Warsaw, Poland 2013. You’ll have a chance to participate by voting on book covers, and a few readers may even get a sneak peek prior to publication. A book trailer with Henry’s voice is under production. Stay tuned for more news. This entry was posted in About Katrina, Henry Zguda Stories, On Writing by Katrina Shawver. Bookmark the permalink. So excited for you my friend!! I can’t wait for you to see fruits of your labor of love in print!!! I can’t wait to see it in print either! Notify me when the book comes out. Thank you. Of course. News will be posted regularly here and on my Read Katrina Shawver Facebook page. You can sign up for email notifications – which I only send when I post a new blog post. I look forward to your feedback once it is out. So many big hugs and congratulations to you!! What a journey–wow. Henry’s life has been honored by your dedication to preserving and sharing it with us—I can’t wait to read it. He would be so proud, I know. Well done my friend, well done. I knew my father was an Auschwitz survivor, but after his passing, and requesting existing files from the Concentration camp museum archives, I was surprised he also was marched to Buchenwald. I was wondering if the polish survivor you met, gave you more details to the long trek. It would fill in, the many questions of hardships, that my father endured, and never spoke of. Hi Stanley, I was fortunate to meet Henry later in life, as I think like most survivors, he didn’t want to dwell on, or bring up, the difficult years. Send me an email at katrina@katrinashawver.com so we can connect. Unfortunately the “dead march” as Henry termed it, happened so fast no records were kept, especially as many prisoners died on the way. But I may have some options for you. I look forward to connecting. Looking forward to reading this book. I am of Polish ancestry. Dziękuję bardzo! What part of Poland? I visited Kraków and Warsaw in 2013. Beautiful. Bless you Marcia for your unending support. Na zdrowie! You DO know part of his life and you and Roman have been wonderful supporters. I hope it delivers the story, and with accuracy. I’ll have given it my best. YAY!! awesome! Congratulations! love you! So very glad for you!! Love reading your blogs so look forward to the book! Did you make it to Tucson in March? Not as good as last year but still most informative. Give us a heads up when the book comes out! Would love seeing a sneak peek!! Yes, I was there. There weren’t as many big names but I did find some good workshops. The highlight was meeting Martha Hally Kelly, because her book Lilac Girls also deals with Polish women, subjected to horrible surgeries, in Ravensbruck. We share a common topic, and her book has been wildly successful. I can only hope for the same. She’s a lovely person. Wonderful! This story needs to be shared, both to preserve Henry’s history, and to provide a sense of hope that we can survive the very worst experiences with the help of friends and an optimistic attitude. I am so excited for you, Katrina! And you played a huge part in it as my editor. What a labor of love your book has been! Don’t I know it after having spent hours with you concerning some of the difficult German language. You persevered! If only Henry could see your result. I am sure he would be very proud and most likely, humbled, too! Lots of luck and success! Vielen Dank, my friend. Vielen Dank. Congratulations!! It’s been a long journey, and I am SO proud of you for accomplishing this final goal. You have put your heart and soul into this project, and I know that the book will reflect all of your love and respect for Henry, his story, and this important aspect of Polish history. I am so happy for you, and am looking forward to holding an officially published (and personally autographed ;D) copy of this book in my hands and enjoying every page! I look forward to seeing it in print as well! Katrina: Your labor of love never ends. You have bestowed on the hero of your story….justice and a golden star. You are very wise in picking the best publisher who believes in you and your story. May the project generate a wonderful field of support for Poland and the story you share. Thank you Cindy. With support like yours, it’s off to a great start. Cheers!